The use case where I’ve used this approach most often is with social media exports — most often, with Twitter. 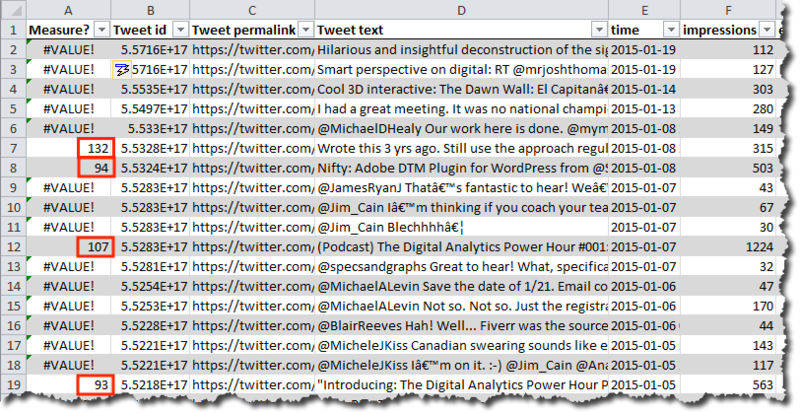 In the most recent situation, my client had an export of all tweets that used a specific conference hashtag. Her organization was trying to introduce a secondary (relevant) topic to the conversation around the conference, and they had a separate hashtag. So, she was looking to identify, from the 16,000 tweets at the event, what percent of them also included the hashtag that her organization was interested in? 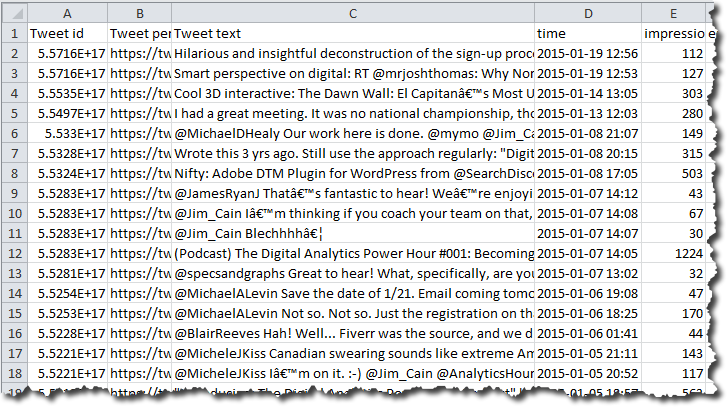 That’s a simple and reasonable ask, and, if the tweet volume is reasonable (let’s say less than 500,000), easy enough to do in under 2 minutes in Excel. That’s kind of ugly, isn’t it? But we now know that rows 7, 8, 12, and 19 all included the word “#measure,” because the FIND() formula tells us where in the cell the word started. All of the other rows didn’t include the word “#measure,” so they returned a #VALUE error. <Whew> Isn’t that cleaner? Now, every value is either “TRUE” or “FALSE,” so we now have a true “flag.” But, this flag is a little confusing, because it’s “FALSE” whenever the tweet contains the hashtag “#measure.” That may be fine if we can just keep that straight and jump straight to step 5, but why not make it a bit more intuitive with one additional update to the formula? Note how the LOWER() addition is inside the FIND() function. Since Excel uses parentheses like plain old math does, the innermost parentheses (functions) will get evaluated first, and the first thing we want to do is make the tweet text all lowercase. There are lots of ways this data could be summarized. You could just sort the table descending by the first column and see what row the last “Yes” occurs on. You could have used “1” and “0” rather than “Yes” and “No” in the formula and then just summed column A.
Voila! 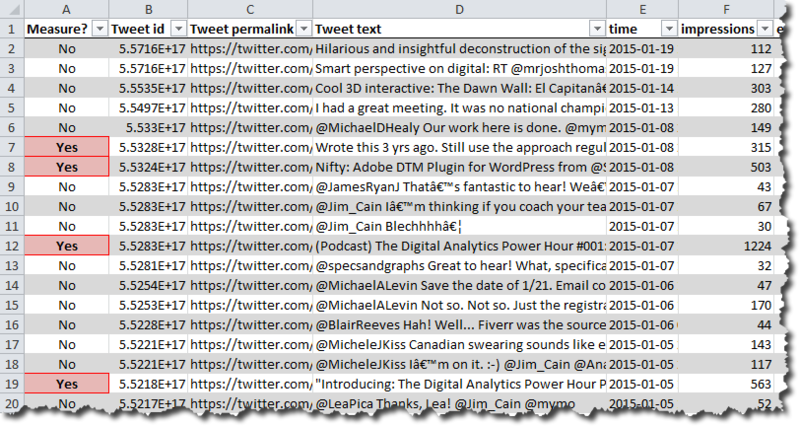 14% of the tweets in the data set included the string “#measure” (regardless of case usage). When I most recently did this for a client, it wasn’t really six steps. It was three: 1) create the table, 2) plug in a formula, 3) generate a pivot table. But, I realize that just throwing out =IF(ISERROR(FIND(“#measure”,”LOWER([@[Tweet text]]))),”No”,”Yes”) can be a little intimidating. I do regularly iterate “from the inside out” when building formulas. 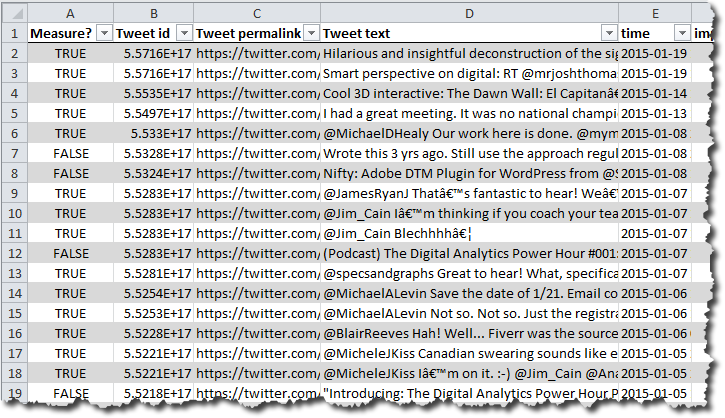 The result can look messy, but not as messy as manually inspecting tweets! Now…chime in with the other 10 ways this exercise could have been approached entirely differently! Ditto; I find COUNTIF/IFS with wildcard match to be easier since it won’t produce an error, thus you can eliminate a formula from the example above. I knew there was a good chance I’d learn something from the comments on this post! That’s definitely a faster solution for the counting. And, it’s not case-sensitive, which is good. It’s a little harder to spot-check the formula, although, I suppose, it would just take initially applying the formula to the first 20 rows and manually checking that you get the same count. I’m having trouble making a strong case for the “flag” approach. I’m going to add an update…but then leave the base post and see what other approaches crop up in the comments. As soon as you tell me that I’m more likely to be able to fully grok Python than I was able to comprehend R, Randy, I’ll track down a Coursera course and have at it. I aced the R course…but still wasn’t able to actually apply it. Consider IFERROR as an alternative to ISERROR. If I used IFERROR, it would actually return the position of the string when the string existed, and I was looking for more of a binary flag. Right? The “SEARCH()” function works the same way as “FIND()” but isn’t case sensitive, so you could drop the “LOWER()” bit. Or easier still, you could just filter the data (ctrl+shift+l), click the arrow at the top of the column with the tweets and search for “#measure” (again, not case sensitive). Then you could just select all of the cells in the column and look at the count at the bottom (or enter “Yes” in a column out to the side and drag it down to tag all of the cells that contain the value). Well…those are *both* better approaches, I think. And…er…I think 95% of my “FIND()” usage going forward is going to become SEARCH() usage.